back to school challenge for this "Be Inspired Wednesday." We got to play with some incredibly yummy things from Cosmo Cricket. I got my paws on the Everafter kit & it's accoutrements. The Kit is generally themed for engagement and/or weddings, but I was amazed at how adaptable it is. It went together so quickly. I don't often use pre-matched things, so it was a rare treat. I do buy pieces of Cosmo paper (who can resist!?) but I've never ever played with a whole kit! That Cosmo stuff is good to the last scrap! hehehe. Happily, all this stuff is covered in a whole lot of "Everafter:"
Miscellaneous: Double-sided tape, paper piercer, needle & thread. Clear Seed beads; Provocraft embossing folder Textile Texture & Cuttlebug machine; Copic markers. Hardware: Drawer pulls for feet-screw driver & drill to affix them. Step 1) Add drawer-pull feet to the wooden box, if you like. A) Stitch around the outside (turquoise embroidery thread), and add Everafter ribbon to the front panel. B) Pierce around the fancy label & stitch seed beads around it. Step 5) Adhere the embellished label to the front panel. Step 7) Adhere the Everafter ready-set-chip (self adhesive flower chipboard) to the ribbon center. The chipboard has a great self stick back, but since this involves sticking to fabric (notoriously tricksy) it might need a little heavier adhesive. Step 8) Make the bunny's BOOK: Cut the tiny school children image from the Cosmo Cricket Everafter Kit packaging & fold it over some white paper to make a wee little book. Add it to the front of the box. Don't Ya just love making something outta nothing at all? 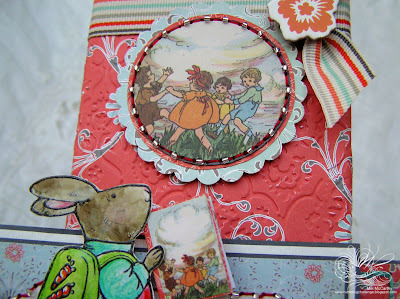 C) Stick the round school children sticker (from the Everafter Cardstock stickers) to some scalloped cardstock layers. D) Pierce around it & add seed beads & stitching. E) Adhere the decorated sticker over top a strip of Everafter ribbon with a bow & a piece of the matching Ready set chip. Digital Texture: This is a speedy way to add a lot of texture to digital images two ways: both with Heat embossing and with a kind of fabric like resist look. Acrylic paint lets you texturize the paper & lets printer ink stay wet long enough to hold embossing powder in a lovely way. Obviously, all the steps are open to interpretation & will vary based on your supplies & the humidity in your area. I find it really fun to experiment with & I hope you have fun if you try it. Image from Mo's Digital Pencil "First Day of School,"
Step 3) Paint with thick wash of acrylic paint & water (I love Kroma brand) & press in a stamp to pull up some of the acrylic paint. Step 4) Repeat painting with wash & pressing in the rubber stamp to pull up some of the acrylic paint until you like the look. Run through an ink jet printer or stamp it & emboss the ink (This is a digital image: Back to School from Mo's Pencil embossed in clear embossing powder. Please note: I'm not sure if the acrylic leaves any residue on Copics; I use the broad/chisel tip for experimenting, so I don't have to worry about it. Very cute project, and very well executed! It reminds me of Beatrix Potter's "Peter Rabbit" story. Your "cheap tricks" are my favorite part of your blog. You have some really good ideas for getting the same results as the expensive tools, without having to buy them. Mel.. this is absolutely darling... I love it! Have you sent a pic to Mo? Please do as I know she would love to see it. Hi Mel, this desk set is sooo cute. the bunny stamps are so sweet. Wow!!! Mel, you've made another fabulous project here!! Great colors and lovely details!!! Hope you are doing well!! Loving it as usual Mel! The embossed CC paper looks almost like fabric...really love this effect. Oh my goodness - I am just BLOWN AWAY by your creativity! This is gorgeous - absolutely gorgeous! Another gorgeous project with a totally amazing tutorial! I love the sweet images you used and that fabulous coloring technique! these are so beautiful! I have the Everafter paper, chipboard and stickers so I just might have to play along...if I can find the dern time! heehee I happened upon your site while looking for a 6" x 6" envelope template which I still cannot find :( But I'm very happy I found your site!!! Okay...I can't even imagine being as talented as you are...this project is just amazing! Just wonderful! Thanks for such detail in your explanation. Just amazing. I love so many things about this project I don't know where to start from the great texturized/embossing technique to the adorable bunny images to the scallops and beaded stitching. Wonderful job. WOW!!! That's detailed. Great job. well..it's nothing less than OFF THE WALL AWESOME!!! 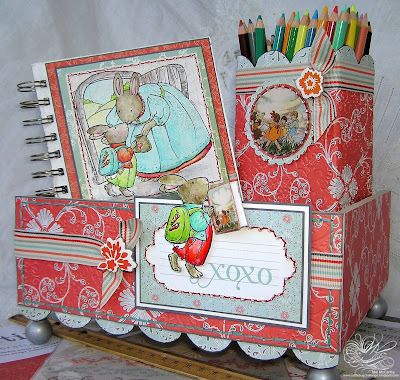 OMG GF how adorable is this you are just amazing the Beatrix Potter theme is awesome and all the goodies you have displayed in that beautiful box WOW. Such a cute back to school image. Love what you've done with it. All your attention to detail is amazing and fabulous. Did you get your new folders yet? I hope they found your missing package!! love how the texture came out on the orange paper! Looks so cool! This is a great project mel... i love and admire ur art and the way you add those lil somethings in your cards and projects.. u are the queen of creativity!